7 flights of about three hours duration were spent in takeoffs and landings at Elizabeth City, North Carolina. 73 instruction flights of about two hours duration were made at Jacksonville during which 11 second pilots were soloed for local fair weather flights. 74 solo flights of about two hours each were made perfecting landings, instrument work and anti-submarine bombing. 86.3 hours of instrument flying were logged including solo pilots time. 52.9 hours of night training flights were used for landings. 185.6 hours of night flying were accomplished during operational missions. This included check-out of PPCs in night flying. 30 hours of radar training flights were registered. About 10 May 1942, 90% of the pilots participated in flights for observations of a submarine running at various depths in the Chesapeake Bay area. 59 flights of two to three hours duration each were made during which four crew members fired 50 rounds apiece at a float light and the pilots dropped 8 miniature bombs for A/S bombing practice. Each of ten PPCs made two flights practicing A/S bombing of a submarine in joint exercises at New London, Conn. About 8 miniature bombs were dropped on each flight. Each PPC made two or more "dry runs" and dropped two practice head torpedoes on the Narragansett Bay torpedo range. 32 Torpedoes were dropped in all. 87.3 hours of 25 flights were devoted to navigation training. Ground training entered the picture as well with 749.8 hours completed in the link trainer. Lectures were given on A/S bombing, surface machine gun firing, intervalometer operation, small arms. All pilots attended a lecture on board the U.S.S. Albermale in conjunction with torpedo firing. Navigation lectures were given and all pilots other than PPCs were required to work a navigation problem each day. Communications, engineering, recognition and flight rules were also a part of the ground training program listed in this initial report. Successive training reports showed that a synthetic 3A2 gunnery trainer was in use; lectures were scheduled on operation of the M.A.D. and pilots were required to perform a set-up on the ground. Lectures were given in September 1942 by Lt. E.C. Smith who had returned from the anti-submarine warfare school at Boston, Mass. At the same time one officer and five radiomen completed a two weeks radar course held at the Naval Air Station, Jacksonville. Daily blinker practice was scheduled for all pilots who were not flying. The training program was momentarily interrupted in May 1942 when the squadron conducted a series of tests and made a formal report to the Commander Patrol Wings Atlantic Fleet on performance data for war planning purposes for model PBY5A airplanes. The submitted enclosure gave an absolute range for the airplane of 1990 nautical miles and a range for planning purposes of 1393 nautical miles. Endurance for absolute range was determined to be 20.9 hours; for planning purposes, 14.6 hours. Operational missions took up most of the available plane hours during VP-94s first months in South America. 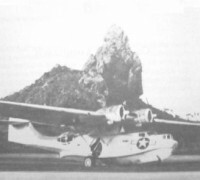 But advantage was taken of the land target at Natal and and the perfection of low level horizontal bombing in the PBY5A. 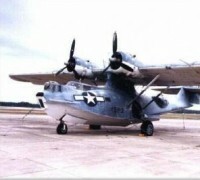 By August 1943, tow target services were available with a PBY5A of utility squadron 4 based at Ibura Field, Recife. The Fourth Fleet added to the training aids in the South Atlantic area by September 1943, offering night look-out training at Camp Ingram, Recife; a synthetic anti-aircraft machine gun trainer; A/S land targets for aircraft at Recife, Fortaleza and Natal; an A/S diving target at Aratu; a plowshare target at Belem and a tame Brazilian submarine in a sanctuary near Recife. VP-94 was scheduled from time to time to make complete, simulated attacks on this friendly submarine throughout its stay in South America. By February 1944, lighter than air was established in Brazil and joint air-blimp exercises were scheduled. These consisted primarily of homing training with one or more blimps originating the homing transmissions and the Catalina's homing in. Survival training became a necessity, especially in the early days in Brazil, when the pilots were flying under undesirable conditions over jungles, mountains and ocean, with very few navigational aids. One of the most complete survival programs was held in August 1944 when the squadron commander and crew, including the mascot "Joe", the monkey, made an overnight survival trip to one of the inlets of the region. Survival training has been pointed at self-care and preservation, and use of the emergency equipment in the airplanes. By the time the squadron moved to Ipitanga in May 1944, operational hours were becoming fewer and fewer each month. An intensive training program was instituted as a result. Anti-submarine exercises were scheduled frequently, making use of both a fixed target and the towed target at Aratu. The coast guard cutter there was also used in simulated night flare attacks. Each PPC was thoroughly checked out under the hood in daytime before attempting his runs on the cutter at night. The newer Pilots in the squadron were given a thorough grounding in all phases of PBY5A operation as soon as they reported in. Bounce drill (day and night) was scheduled, as well as instrument work, use of the radio range and other radio gear, navigation, formation flying, single engine operation, and water bounce. A homing exercise was also added to familiarize all pilots with the proper procedure to be followed in locating the transmitting aircraft. Training in the air has been supplemented on the ground. A lecture was scheduled for each morning meeting including technical discussions of the aircraft and its equipment, anti-submarine procedure and doctrine, recognition of ships and planes, enemy tactics especially as affected the submarine warfare department, gunnery, aerology, water work, and correct communications procedure. In November 1944 the squadron participated in a battle training problem ordered by CTF 44. Four of its aircraft were detailed to make a torpedo attack on two "enemy" carriers. 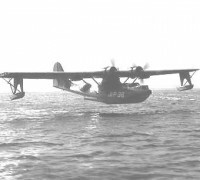 The problem was complicated by the necessity for close cooperation with a variety of other aircraft including PBMs, PVs, and PBY4s. The simulated torpedo attack was launched just after the two carriers had swung into the wind, preparatory to landing aircraft. Previous to the battle training problem, a detachment of four FMs had been assigned to the squadron for fighter affiliation training. The training received proved of practical value, when the Catalinas were able to evade all but one of the "enemy" planes which made runs upon them. During the month of October 1944 the squadron completed 1167.7 hours of training in 8 aircraft and was specially commended in a gunnery memorandum issued by Fleet Air Wing Sixteen. The training schedule of that month included instrument flying, navigation, operational practice, night flying (including night bounce and night flare attacks), day flare attacks, plane to plane homing, fighter defense, formation flying, water bounce and familiarization. 44 aircrew men completed a refresher gunnery training course and all squadron radiomen received training in blinker, radio check, transmitters, communication procedure, receivers and direction finders, radar and IFF. 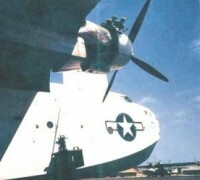 VP-94 took part in the refinement of the twin .50 calibre gun mount for the bow turret of the PBY5As which had been originally developed by VP-84. The VP-94 version had the advantage of an arc of fire 70 degrees in azimuth, 45 degrees depression and 30 degrees in elevation. Boost feed motors were installed so 1000 rounds of ammunition were made available instead of the previous 200 rounds. The mount was not accepted by the Bureau of Ordnance as a design for a twin .50 calibre hydraulic mount had already been accepted. The commanding officer was commended by Comairlant for "the initiative shown in the development of the twin .50 calibre manually operated gun mount."